Vase of unglazed red earthenware painted with yellow, blue and black enamels. 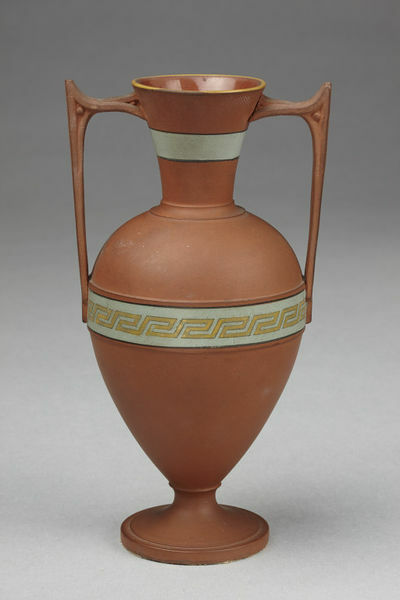 Pointed ovoid body, funnel-shaped neck, spreading foot and two angular loop handles. 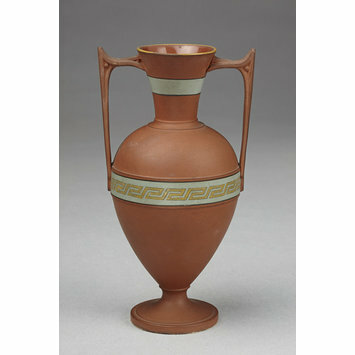 Round the shoulder is painted a band of yellow maeander ornament on a blue ground edged with black. Vase of unglazed red earthenware painted with yellow, blue and black enamels, made by Watcombe Terra-Cotta Co., Torquay, 1869-1876.